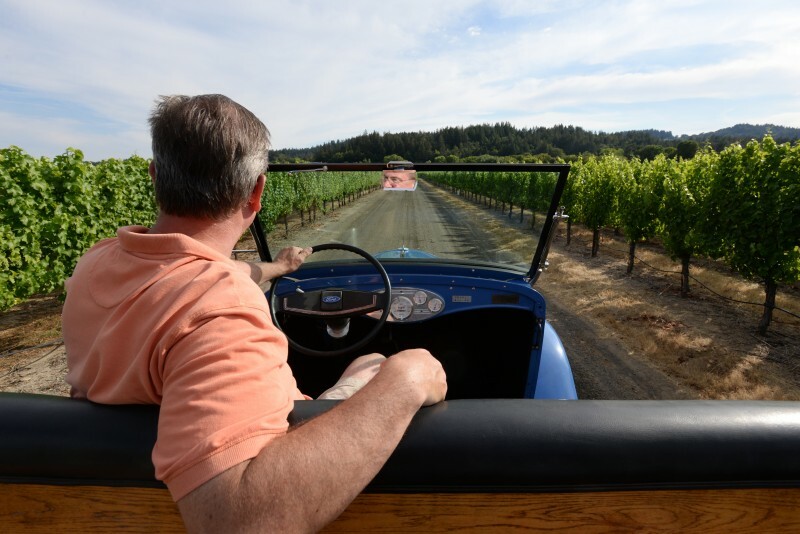 A 1923 Ford Model-T owned by Art Paul of Graton Ridge Cellars in Sebastopol doesn’t run, but it does amuse tasting room visitors. 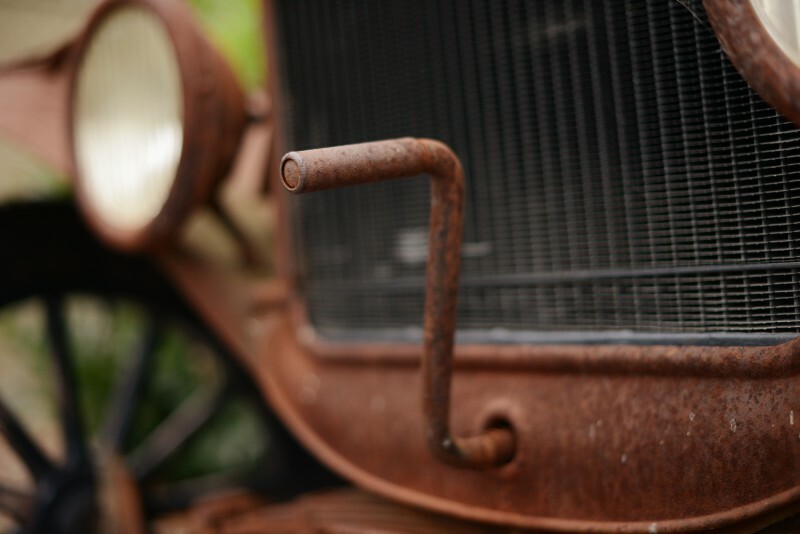 When German engineer Karl Benz built the first pickup in 1895, he had no way of knowing all the uses it would have more than a century later. 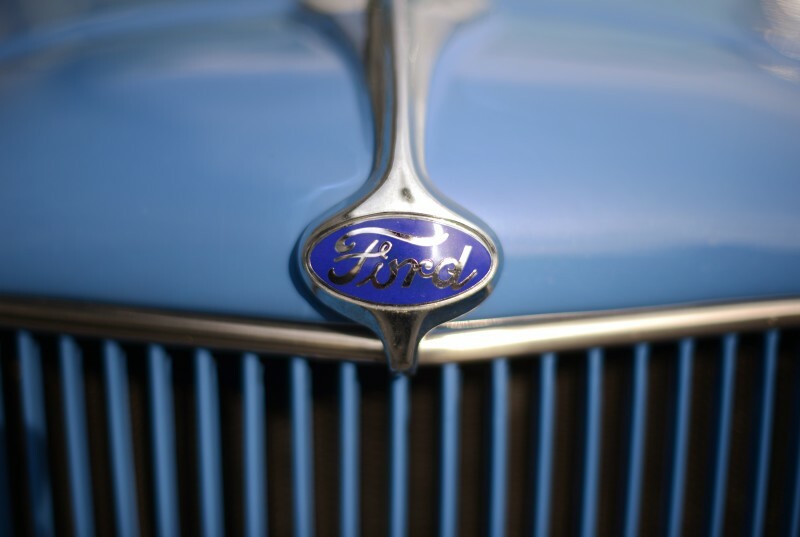 Or that owners would grow so attached, they’d christen their four-wheeled companions with names such as Hilda. And that after a workhorse like Hilda hauled so many tons of grapes, they’d name a bottle of rosé after the old girl. Just ask the folks at Healdsburg’s UPTick Vineyards, who still manage to stack barrels three-deep in her flatbed. Certainly, Benz would get a chuckle over the value today of these old trucks. After a complete makeover, Hilda, a once-abandoned 1948 Dodge Stake, is now worth more than $90,000. Chris O’Neill sitting in a 1936 Chevy at his Corks Restaurant at Russian River Vineyards in Forestville. 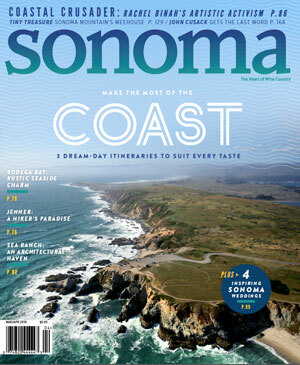 Sonoma loves its pickups — jacked up with suspension lift kits, rolling down Santa Rosa Avenue or towering over the annual Monster Truck fairgrounds mud fest. Lowered until they barely hover over the pavement. Parked along the edge of wineries, the 1980s Japanese-import beaters that carry workers to and from the vineyards. On display in miniature as public art in Healdsburg. Or just sitting out in front of a diner, an immovable icon of our agrarian roots. You can see them lined up in a rusty graveyard on Highway 12 at Melita Road. Put out to pasture along a fence in Rohnert Park. 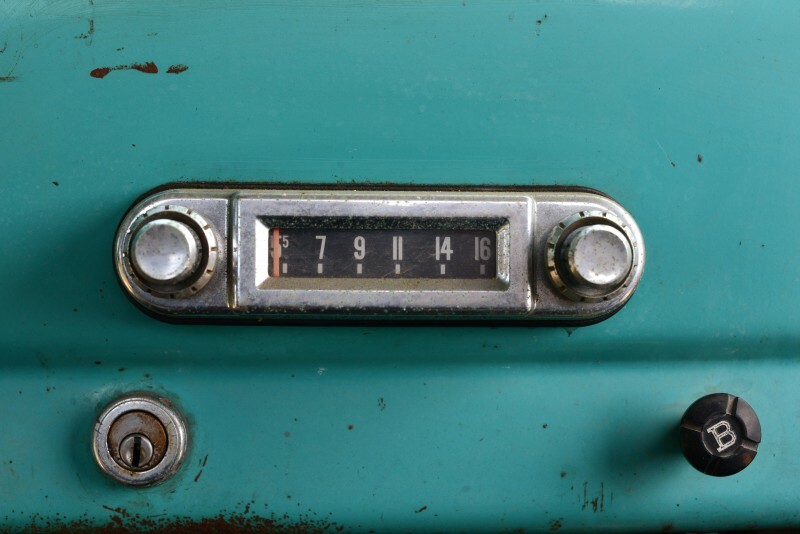 A nostalgic reminder of a bygone era, in front of the Jimtown Store in Alexander Valley. And now, at harvest time, they are the rugged beasts hauling grapes night and day through bustling vineyards. 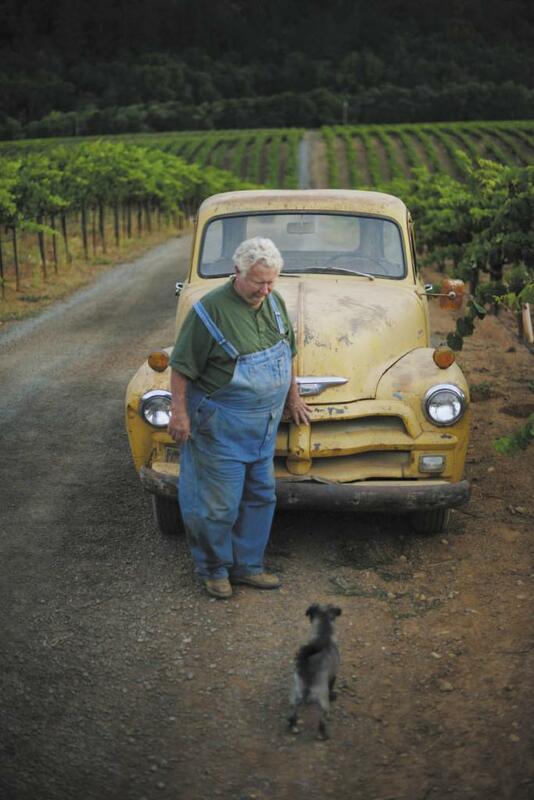 Every August, Rich Mounts checks the brake fluid and motor oil in his ’54 Chevy as he preps for another harvest at Mounts Family Winery in Healdsburg. 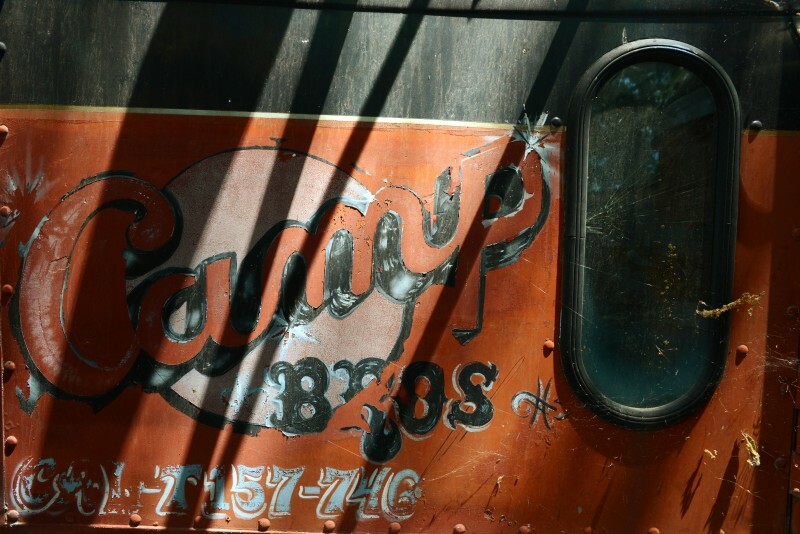 Rusted to a sunburnt char against the orange clay of Dry Creek Valley, the truck looks like it came from the soil and weathered over the years to a fried-egg-yolk yellow or dirty saffron. 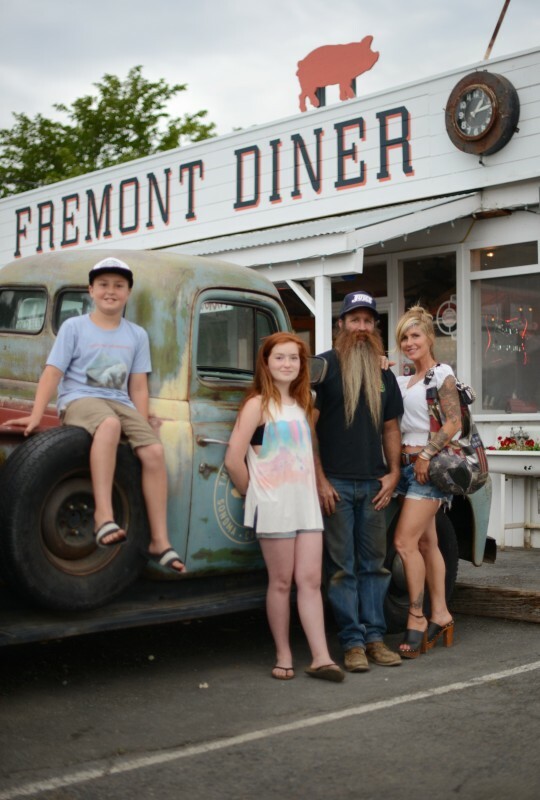 It was actually blue when his father, Jack Mounts, bought it new for $1,625 at Bell’s Chevrolet in Healdsburg. Back then it was used to haul prunes. Sixty wood boxes fit in the bed, which is why the rear window no longer has any glass. It was punctured by one of the long wooden props used to support sagging prune branches plump with fruit. Why replace it when “it’s fresh air, what amounts to air conditioning now,” Mounts said. The only major upgrade he’s made over the years was changing the battery and alternator from 6 volts to 12. 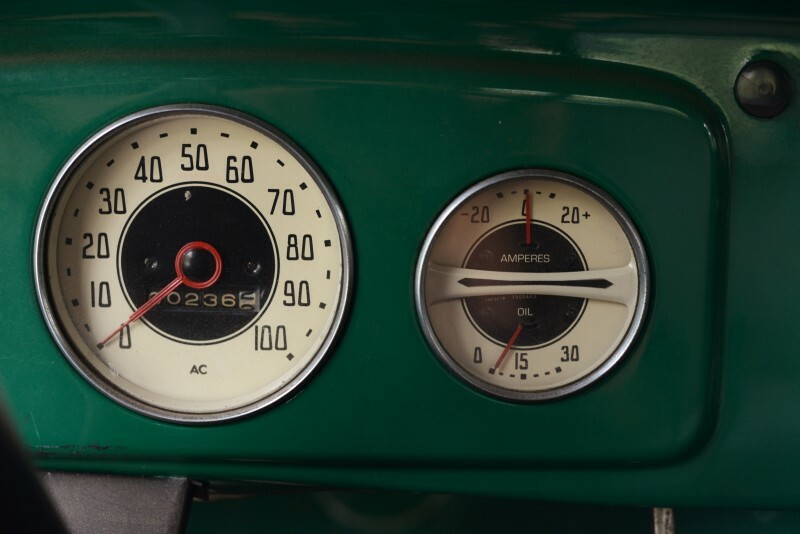 Today, the old ’54 is no longer street legal, but it still toils year-round on the 140-acre ranch. During harvest, it hauls workers from vineyard to vineyard, leaving the fruit bins to larger trucks. There’s always room for sidekick Scrappy, a “walk-on” terrier mix someone abandoned on the property. And hardly a week goes by when Mounts doesn’t get an offer from someone interested in buying the Chevy. 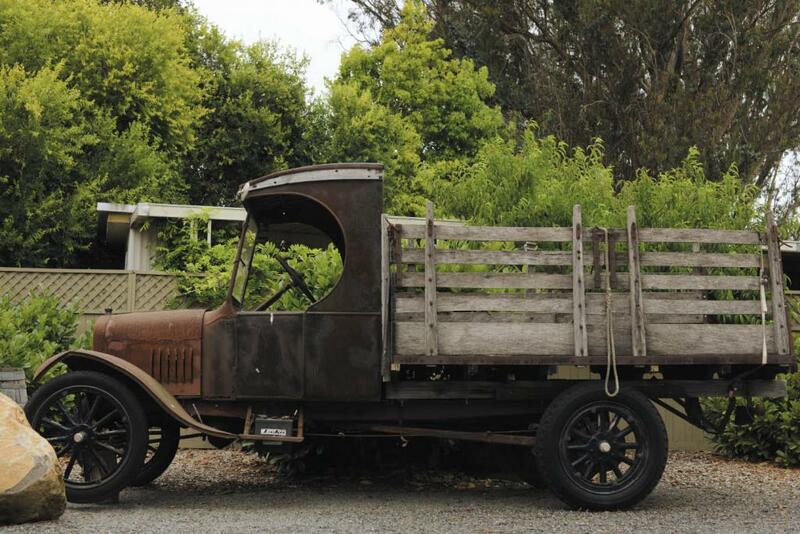 Bengt Akerlind’s compact 1932 Ford flatbed, originally a milk truck at a Petaluma dairy, now works the vineyards at his West Wines in Healdsburg. 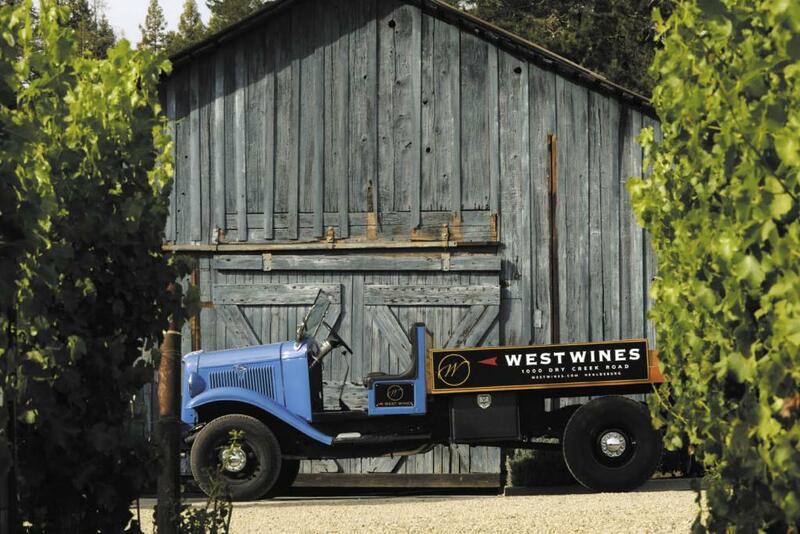 Across the valley at West Wines, owner Bengt Akerlind unloads the ceremonial first bins of grapes every fall from his blue 1932 Ford flatbed. In a former life, it was a brand-new milk truck at Borden Dairy in Petaluma. 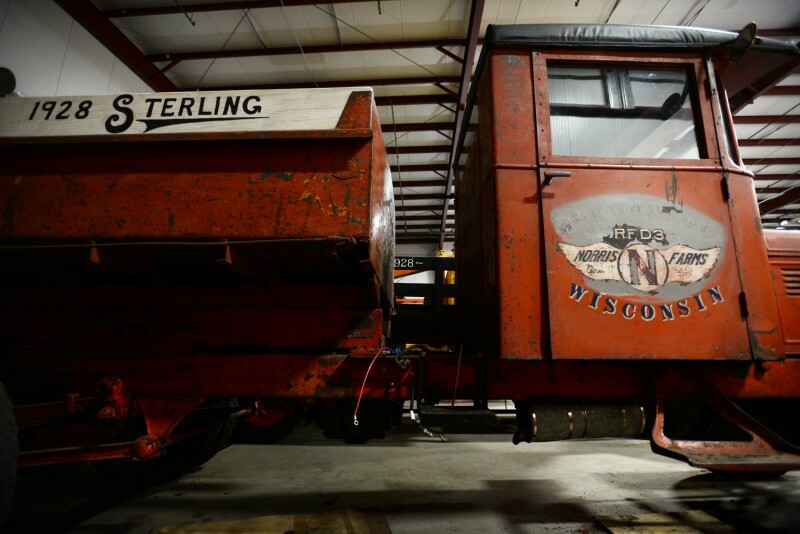 Akerlind bought it for $2,000 in 1999 and spent two years restoring it with a friend. Over the years, he’s spent so much money on his Ford, he won’t cop to a figure. But thanks to a new drivetrain, it can hold eight barrels of juice and hit around 55 mph on trips down to Windsor. 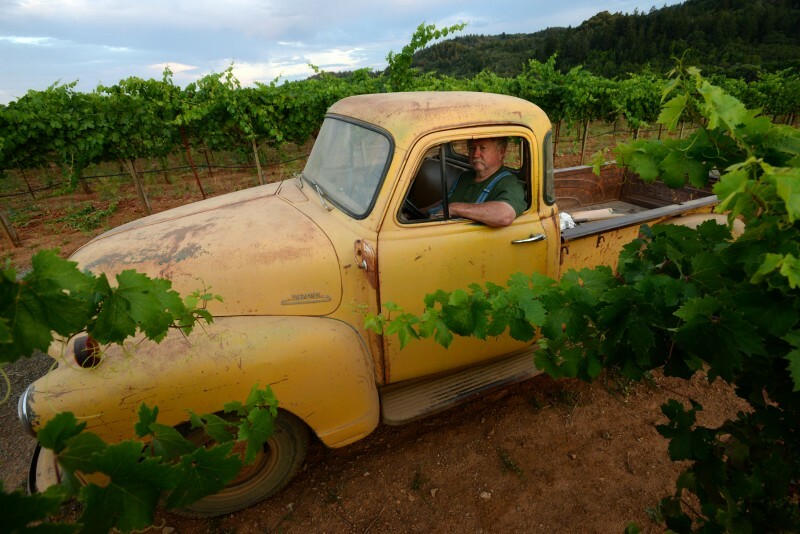 It’s the same allure at A. Rafanelli Winery, where three beautifully restored green 1947 Chevy flatbeds haul the grapes the family sells to other wineries. 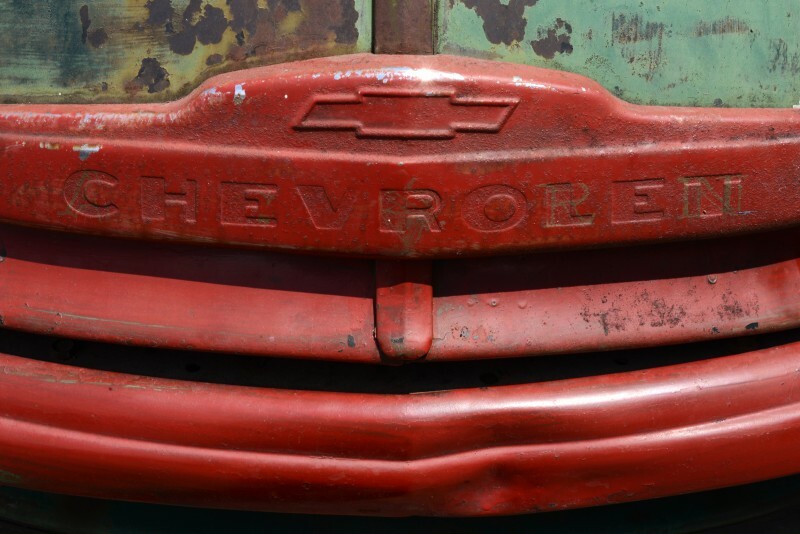 And at Acorn Winery, where owner Bill Nachbauer restored a muddy-green 1950 Chevy flatbed to haul juice in barrels. 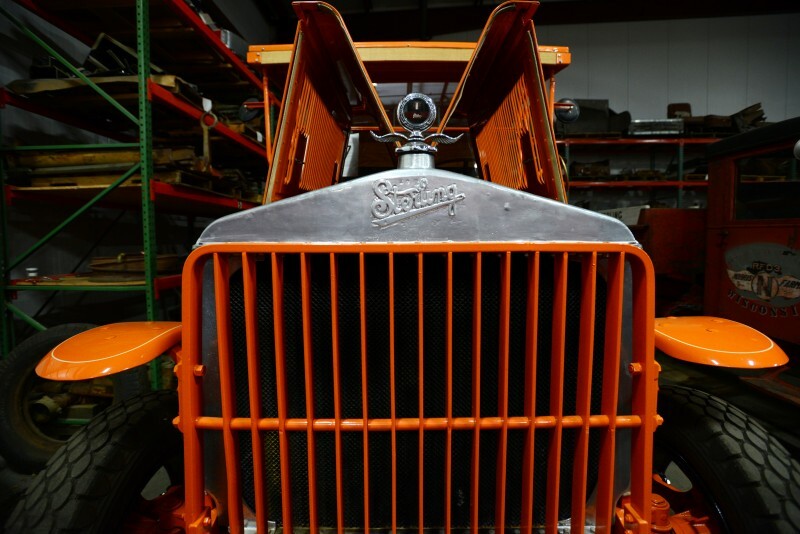 At the Timber Crest Farms wine collective, adjacent to Kokomo Winery, landowner Ron Waltenspiel has spent the past decade restoring a rusty junkyard of Sterling trucks. At Jimtown Store, a dusty-red, 1955 Ford pickup (and former county firetruck) plays parking lot mascot, if it’s not at the Saturday morning farmers market in Healdsburg. 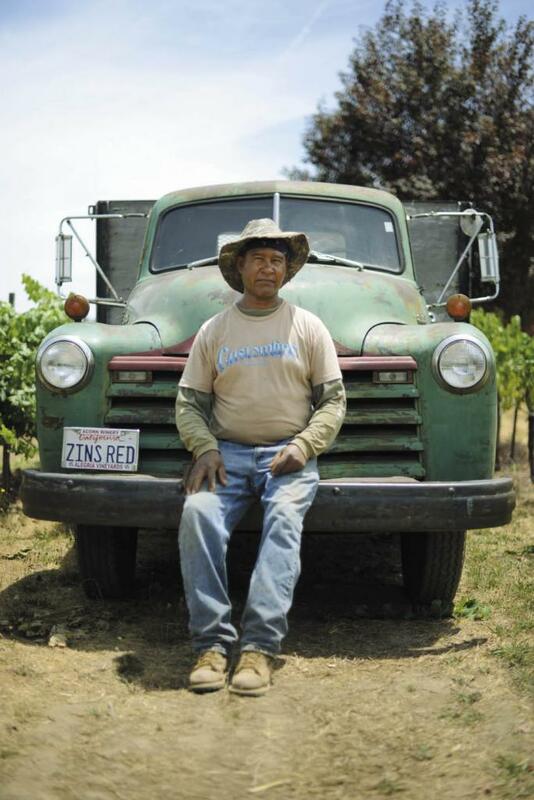 Vineyard worker Manuel Apolinar poses on the 1950 Chevy owned by Bill Nachbauer of Acorn Winery in Healdsburg. 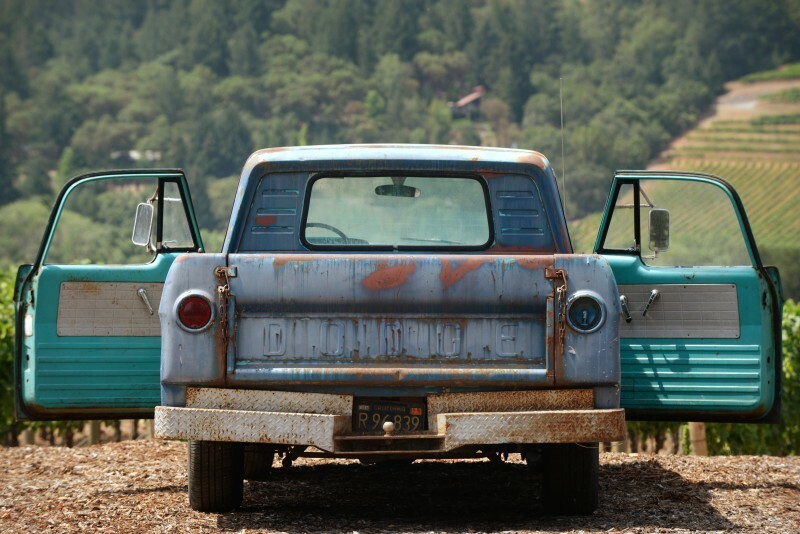 At Cast Wines in Geyserville, owner Jack Seifrick has adopted a 1964 Dodge D-100 Sweptline truck. 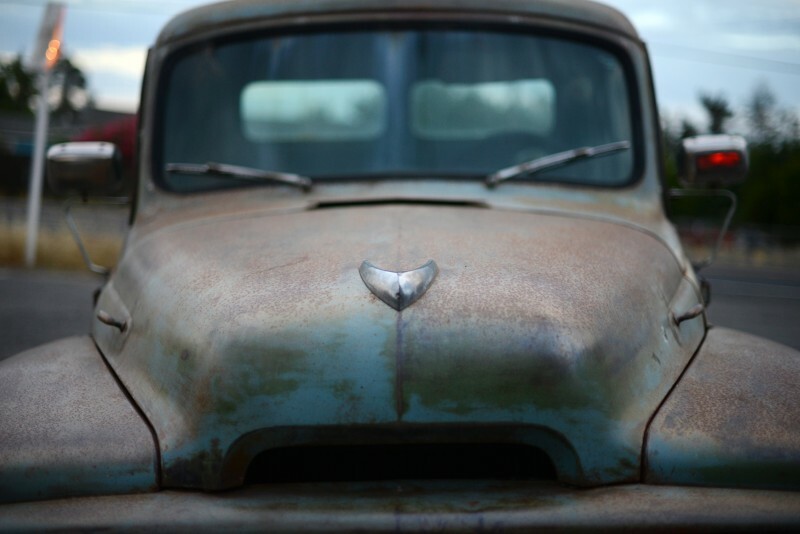 The Dallas entrepreneur, who purchased the vineyard in 2012, was picking around the Salvation Army one day and bid on a weathered blue pickup (with original aquamarine interior) that had been retired after 50 years on a farm. Then there are the trucks that don’t roll anymore, left behind as reminders of simpler times, when you could lift the hood and name every engine part you saw. 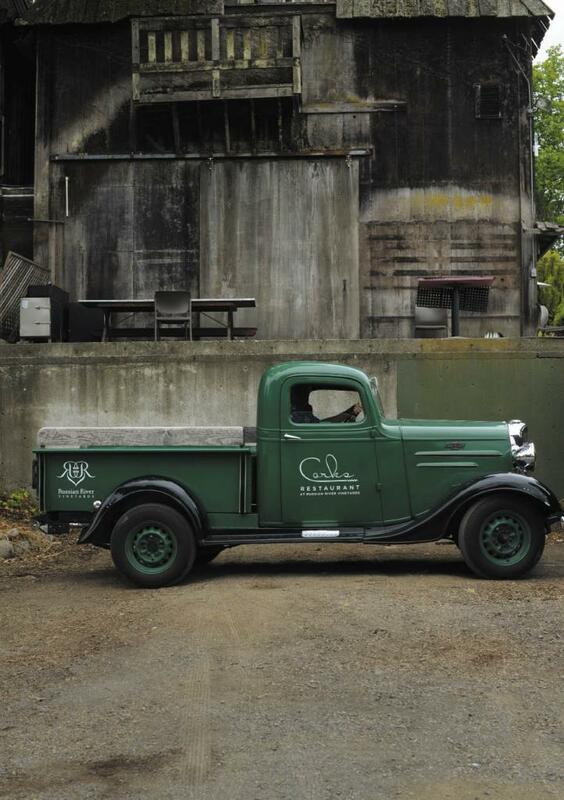 At Robert Rue Vineyard & Winery in Fulton, it’s a ’42 Chevy flatbed that paid its dues hauling grapes in the 1970s and now gets far more attention as a photo prop in front of the winery. 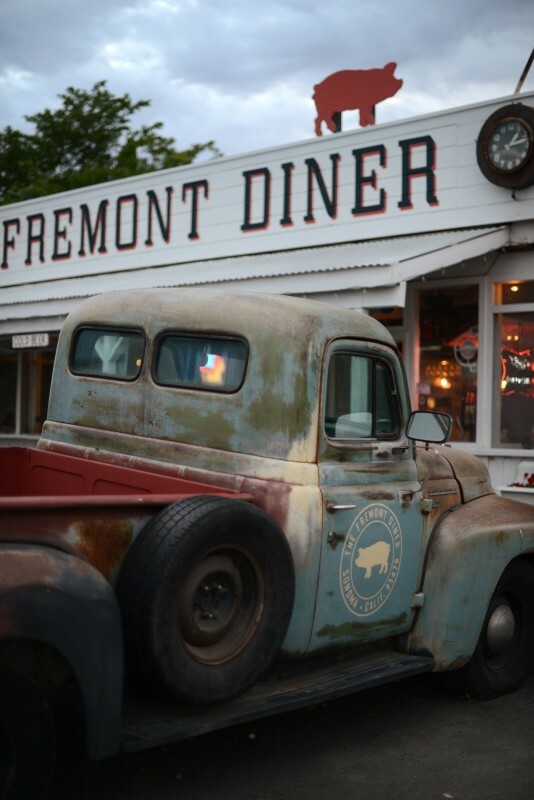 In the parking lot of the Fremont Diner in Sonoma, the official greeter is a 1954 International Harvester R-110 long-bed pickup. Where it’s not faded blue and seaweed green, a beautiful rust has taken root.